The quality of the credits leads us to expect a metaphor for the human condition. Tricky blighters, these metaphors, but under the stingingly funny pen of Harold Pinter (adapting with untypical optimism, the novel by Russell Hoban), this story of the loneliness and petty tyrannies of urban life jumps vividly to life. 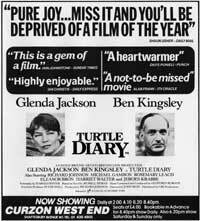 It is hard to think of two actors better matched to play Pinter than Glenda Jackson and Ben Kingsley. They milk every nuance, point up every missed beat and relish each irony and repetition in the script. Turtle Diary is a fine film that charts movingly the unnoticed despair of everyday lives, the sufferings of those who endure loneliness in silence.